Many component manufacturers compete to see who can release the fastest/smallest/largest technologies first, and the hard drive industry is no different. In January, Seagate announced it is bringing 14TB and 16TB HDDs to market within the next 18 months, but Western Digital has beaten its rival to the punch by launching the world’s first 14TB hard drive. 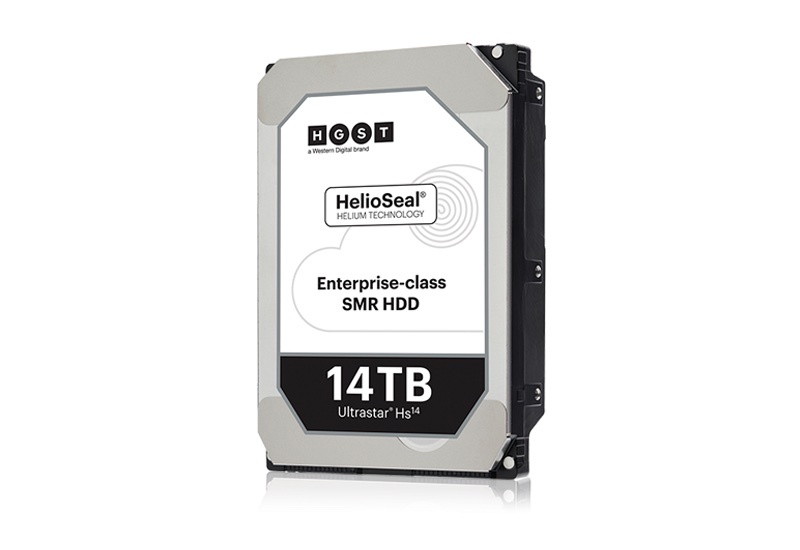 Like other drives that feature massive capacities, the HGST Ultrastar Hs14 is filled with helium instead of regular air, which means less drag on the platters. It features 4th generation HelioSeal technology and uses 2nd-generation host-managed SMR (Shingled Magnetic Recording) on eight platters to hit that huge capacity. HGST says the drive consumes just 5.2W at idle and 6.2W during operation. That works out at 60 percent lower idle watts per TB than an 8TB air-filled drive. It’s available in SATA (6Gbps) and SAS (12Gbps) models, and has a claimed 2.5 million hours MTBF (mean time between failures). "Over 70 percent of the exabytes Western Digital ships into the capacity enterprise segment are on helium-based high-capacity drives and continue to support customers with outstanding reliability, performance and value Quality of Service (QoS)," said Mark Grace, Western Digital’s senior vice president of devices. "The TCO and reliability benefits of our HelioSeal platform are the foundation of our leadership in high-capacity enterprise storage." While it’s true that PC game installs are getting bigger, these drives are aimed at enterprise customers such as cloud and hyperscale data centers, rather than regular consumers. No word yet on price, but expect it to be expensive. The Hs14 is currently shipping to select OEMs and comes with a five-year limited warranty.